Published: Jan. 24, 2013 at 07:58 p.m. 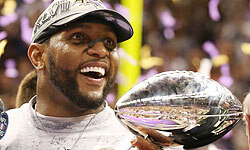 Updated: Jan. 25, 2013 at 01:43 p.m.
Louisiana native Brandon Jacobs should be headed to New Orleans next week for his second Super Bowl in two years. Instead, the running back is busy being a full-time dad because the San Francisco 49ers waived him to start the playoffs after suspending him before that. But Jacobs wouldn't change a thing. "My emotions are I want the 49ers to win the game," Jacobs told Mike Garafolo of USA Today on Thursday. "I don't have any regrets about not being there whatsoever. I don't feel like I should've done things differently. I don't feel anything else. I'm a hundred percent happy where I am." Jacobs might not regret it now, but it's hard to imagine he won't regret it later. You only have so many chances to win a Super Bowl ring in your home state. Jacobs struggled to find a foothold with the 49ers. Even once he was healthy, he couldn't get on the field. He voiced his displeasure with the situation a few times, and 49ers coach Jim Harbaugh lost patience. The final straw came when Jacobs posted on Instagram a series of pictures of his time with the New York Giants. "I am on this team rotting away so why would I wanna put any pics up of anything that say niners," Jacobs wrote at the time. "This is by far the worst year I ever had, I'll tell you like I told plenty others. I don't understand why people are angry at me because I wanna do what I am paid to do." The 49ers had enough. If Jacobs' skill set could have helped San Francisco, the team would have played him. But his inactive reserve status and tendency to complain were enough for him to get the boot. "Conduct detrimental to the team, to me, is bashing the team, getting in trouble, distracting the team, whatever. However, I don't think it was that bad," Jacobs said. "It came across being disrespectful or whatever it was. I didn't mean to disrespect anybody or hurt anybody's feelings. I didn't have any disrespect. I didn't mean to do any of that. I was told I would get some of the pie and I didn't. That kind of made me a little upset and made me snap." Jacobs plans to play football in 2013, but we're not sure he'll get another chance. He will, however, make a cameo in Louisiana next week. Jacobs will do his Mardi Gras thing on Feb. 1, riding in a parade with the "Krewe of Hercules" in a parade in Houma, La.